We stock a wide variety of stuffings to add to your foodservice dishes for dinner and thanksgiving. Chicken, turkey and cornbread stuffings from Campbells and Nabisco are the perfect side dish for your chicken and turkey meals. Campbell's Pepperidge Farm Chicken Herb Stuffing Pan 1.5 Lb. General Mills Betty Crocker Chicken Flavor Stuffing - 3.56 Lb. General Mills Betty Crocker Traditional Herb Stuffing Mix - 3.56 Mix. 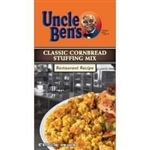 Mars Foodservice Uncle Bens Classic Cornbread Stuffing Mix 28 oz. Kraft Stove Top Chicken Flavor Stuffing - 49.5 Oz. Kraft Stove Top Flexible Serving Chicken Stuffing - 48 Oz. Precision Foods Milani Homestyle Herb Stuffing 3 Lb. Chicken Flavor Add Water Butter Shelf Stable Stuffing Mix - 28 oz. 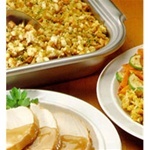 Stove Top Stuffing Chicken Mix - 6 Oz. 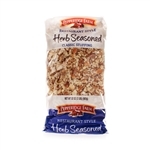 Mrs. Cubbisons Kitchen Stuffing Traditional Seasoned - 55 Oz. Cornbread Stuffing Mix - 65 Oz. Foothill Farms Whole Grain Stuffing Mix - 28 Oz. Roasted Turkey Bread Stuffing - 7 Oz. Wholesale Chicken and Turkey Stuffing for your restaurant and food service cooking pleasure. Your patrons will love these delicious sides.